The public release of the NAVO GHRSST Level 4 K10-SST GDS2.0 product provides global daily analyzed SST at a 1-meter reference depth. Image from the new GHRSST product showing global SST for January 9, 2019. Warmer SST values are indicated in yellow, orange, and red; cooler SSTs are indicated in green and blue. Note that SST values are given in degrees Kelvin (K). PO.DAAC image. A new global Sea Surface Temperature (SST) product from the Group for High Resolution Sea Surface Temperature (GHRSST) is now publicly available through NASA’s Physical Oceanography Distributed Active Archive Center (PO.DAAC). The Naval Oceanographic Office (NAVO) GHRSST Level 4 K10_SST version 1.0 using the GHRSST Data Specification (GDS) 2.0 product (DOI: 10.5067/GHK10-L4N01) provides daily global analyzed SST at a reference depth of 1-meter. Data are available from January 9, 2019, onward and are formatted as netCDF-4. 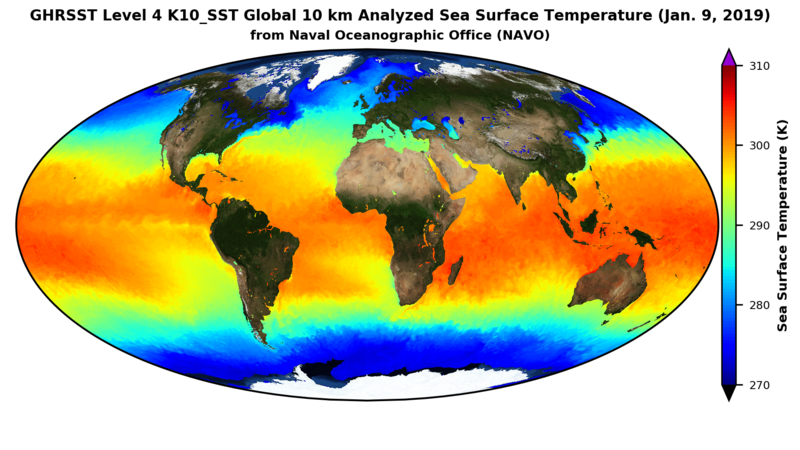 The product incorporates SST observations from the following instruments: Advanced Very High Resolution Radiometer (AVHRR), aboard the joint European Space Agency/European Organization for the Exploitation of Meteorological Satellites (EUMETSAT) MetOp-A and MetOp-B as well as the National Oceanic and Atmospheric Administration (NOAA) NOAA-19 satellites; Visible Infrared Imaging Radiometer Suite (VIIRS), aboard the joint NASA/Japan Aerospace Exploration Agency Suomi National Polar-orbiting Partnership (Suomi-NPP) satellite; and Spinning Enhanced Visible and InfraRed Imager (SEVIRI), aboard the EUMETSAT Meteosat-8 and Meteosat-11 satellites. This product is an update to an earlier product that also used the NAVO K10 algorithm, but used different instrument data. Major updates in this product include updated and enhanced granular metadata information; conversion of the SST file from GDS v1.0 to v2.0 (with updates to the filename convention for compliance with GDS v2.0), and addition of the sea_ice_fraction variable to the product. The objective of the GHRSST is to provide the best quality SST data for applications in short, medium, and decadal/climate time scales through international collaboration and scientific innovation. GHRSST data products are available through NASA’s PO.DAAC, which is responsible for archiving and distributing Earth observing data related to measurements focused on SST, ocean surface topography, ocean winds, sea surface salinity, gravity, ocean circulation, and sea ice.